A panel session about the experiences of North Korean defectors in New Malden is at first sight a strange event to promote as part of an arts festival. But the 7th New Malden Arts Festival overlaps with Malden Fortnight, a celebration of New Malden’s varied community, of which Koreans are of course a significant part. Shin Bona, director of broad-based community arts organisation Theatre4all and promoter of the festival, is known among other things for her work with North Korean refugees. And several years ago, the first North Korean she ever came across, working in a local video rental shop, was Kim Joo-il. Kim Joo-il is the most prominent North Korean in the UK. He is a former captain in the DPRK military. He defected because of the failures of a system which meant that soldiers and people in the countryside were starving to death. The story of Kim’s defection, following the horrific death of his two-year-old niece, is told in The Independent and Vice. Kim escaped to China, and made his way via Vietnam to Cambodia. From there, he had to decide his ultimate destination. He could have chosen the US, South Korea, or Japan, but all those countries are considered North Korea’s enemies. By choosing a less hostile country such as the UK his defection was less culpable. Some statistics. There are estimated to be 100,000 North Korean refugees in China, at risk of being sent back to the DPRK (where they are likely join the 200,000 or so in the prison camps). Around 32,000 refugees have made it to relative safety. Of these, as is to be expected, the vast majority (30,000) are in South Korea. And, somewhat surprisingly, 600 are in New Malden. Wherever a defector ends up, whether in the UK, South Korea or elsewhere, he or she is unlikely to feel at home. And even in the UK a North Korean refugee does not feel safe. Kim is the only refugee who openly campaigns against the regime: others are afraid to put their head above the parapet, fearing for their own lives or for the safety of their extended families back in North Korea. As Kim Joo-il said in response to a question from the floor: in dealing with North Korea it is important to remember that there are two North Koreas — the establishment and those that benefit from it (mainly in Pyongyang); and the people outside of the establishment (mainly in the countryside). And in London, the refugees are of necessity extremely wary of the North Korean embassy, which represents the establishment. Where there is no place for freedom. It is a shame that despite all the reports and coverage of the atrocious human rights situation in North Korea we still need to be told about it. The presentation from Benedict Rogers of Christian Solidarity Worldwide provided context and new information to many in the audience, but somewhat overran its time allocation, turning the focus away from New Malden and rather eating into the time allotted to the question and answer session. 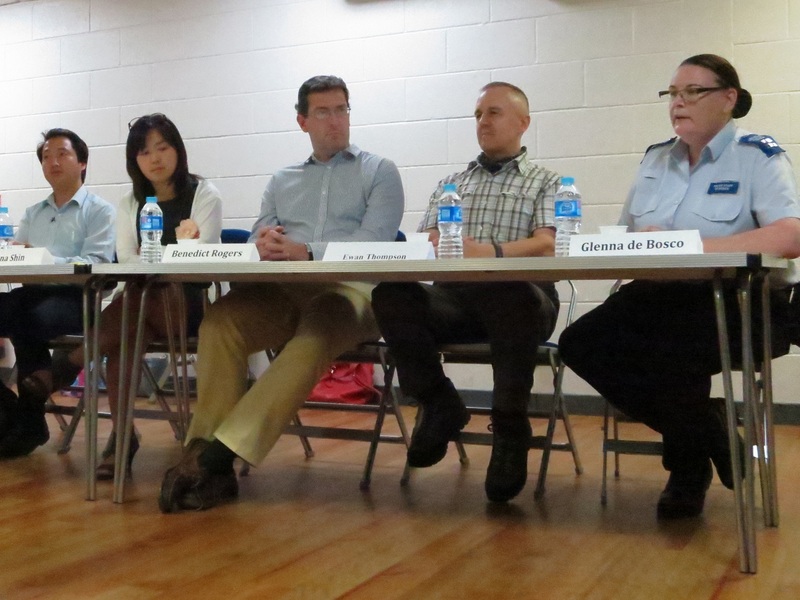 There was no time, for example, to ask Glenna De Bosco, the Korean Engagement Officer from the Metropolitan Police Service, whether she experienced particular difficulties in engaging with North Koreans as opposed to their more numerous compatriots south of the DMZ. She was nodding in agreement, though, as Kim Joo-il was speaking about the severe language problems of the defectors – particularly the older ones – which get in the way of their taking advantage of some of the benefits of living in the UK such as the National Health Service. But one interesting thing she said during her brief presentation was that the number of crimes reported by the Korean community in the Kingston borough was surprisingly low. There was no time to discuss the possible reasons for this. Maybe it is the language barrier again; or maybe it’s because, in North Korea at any rate, the police service is not seen as a “service”: a police officer is something to be feared rather than approached willingly. This was something that was emphasised in Ewan Thompson’s heartfelt presentation. There was appetite in the audience for more discussion, but we had overrun our time allocation. Shin Bona is to be thanked for her initiative in getting this interesting panel together. And let’s hope that this is the first in a series of initiatives in reaching out to understand the experience of the North Koreans in our midst that little bit better. The panel session on The life of North Koreans in New Malden was held on 26 July 2014 at the Malden Centre as part of the 7th New Malden Arts Festival. Sinae Hong Youngeun Koo I would say definitely there is a language barrier issue… I know a few NK who would like to learn/improve English. However, living in New Malden where you can live without saying a word of English, it is harder to learn. Also it is quite hard to find a group that offers English lessons appropriate to their English level….And Thank you for a very informative review as usual, Philip Gowman. Sinae Hong Youngeun Koo Heard there are some run by local chuches.. But most of N Koreans in their forties/fifties are busy working as well…. (possibly on the weekends too…) It would be great to see such support services get initiated in New Malden! Sinae Hong Mike Glendinning I’m sure that’s not all N Koreans… I’ve met many who wanted classes….! But I do agree putting food on the table comes before learning English…. Mike Glendinning Possibly, but there are a few (free) English programmes online specifically for defectors. Where there is a will…..
Sinae Hong Mike Glendinning might be an idea to let them know – are they aware of such programmes?? Mike Glendinning No idea. For what it’s worth, we looked in to running such programmes. It’s pretty much a no go for equality reasons. Youngeun Koo I guess it depends on how they see English – some might think that it’s something that will just make their life a bit more convenient and others might more focus on and value its possibility to increase their employability. Again, for me it shows the lack of a targeted support system that understands individuals’ specific circumstances and needs.